Today, May 15th 2018, Akeydor Limited launches a new activity at sea: Akeydor Blue starts the rental of luxury rib boats (rib cruises) all around Greece, with aim to travel / sail people to the Greek isles, and to the Greek seas, with speed and safety. 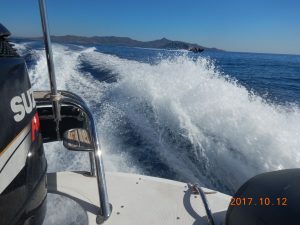 The rental of each boat is made with, our without a skipper, depending on whether the guests have a valid operating license to sail. Akeydor’s goal is to travel people to the Greek seas with safety, and to become the means of enjoyment of the Greek seas and sun. Akeydor Blue’s destinations cover the whole of Greece: From Athens Riviera, to the Ionian sea, to Sporades, Cyclades, Peloponnese, Dodecanese – and the goal is for personal enjoyment as well as for business engagement, or for special moments with family and friends. More than 30 boats are available today and safety is the ultimate care. The new activity is part of the Group’s investment program in the tourism sector for 2018.